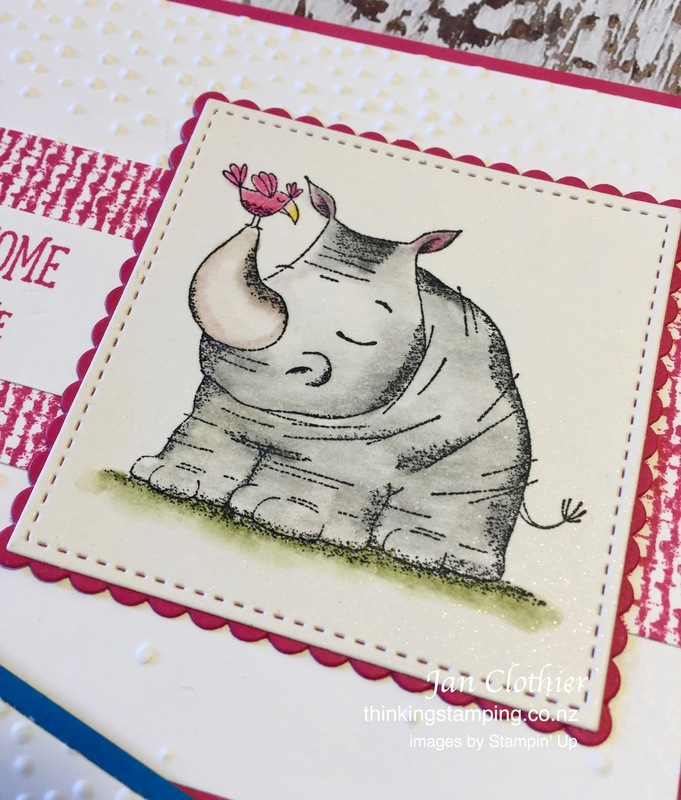 LeAnne's sketch challenge last week at The Paper Players drew out some spectacular cards and it was a pleasure to comment on them ... and much harder to choose just one as a Cut Above. 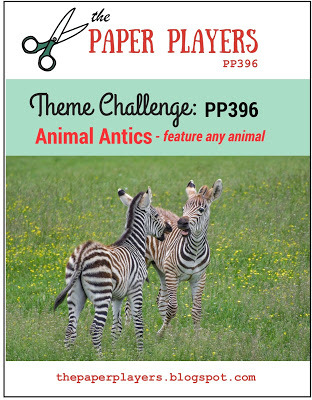 Let's see what you do with Joanne's animal theme challenge this week. I'm not a great one for animal stamps but at On Stage in April, everyone who attended was given a set called Animal Outing. It features some great critters and some useful sentiment that make it very versatile. There's also a set of dies and some DSP that complete the suite. 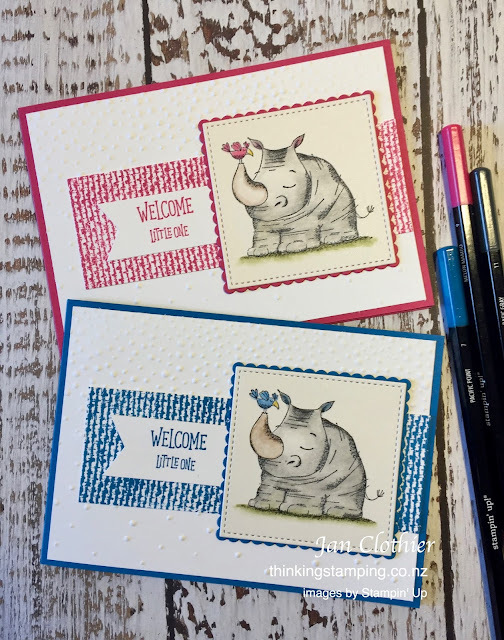 I chose to use the rhinoceros and his little friend to make a pair of baby cards. I don't make many baby cards but when I do either do a pair, like this, or a trio (male, female, neutral). They're a simple design but I like the texture that comes from the background embossing and the fabulous Burlap background stamp which I stamped then used like a strip of DSP. 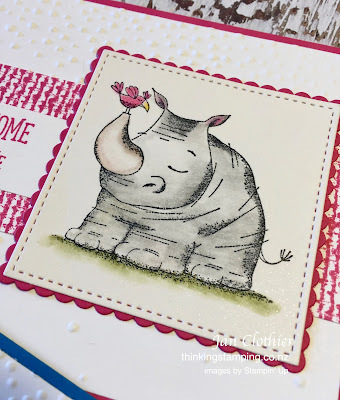 The thing I like the most about this card is the rhinoceros. I set myself a little challenge to do some watercolour pencil work and I'm pleased with how this pair turned out. We'd love to see what animal you choose and what you do with it. 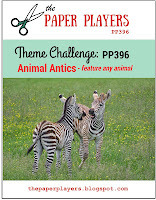 Pop over to The Paper Players and see what the rest of the team have done, then join in with us with your own animal card. Here's a quick reminder of the rules at The Paper Players. Create a NEW paper-craft project specifically for this challenge. Please link your card to no more than four challenges, total. Entries linked to more than 4 challenges, including ours, will be deleted without notification. And, of course, you can shop with me from anywhere in New Zealand by clicking the SHOP NOW button in the sidebar of this blog.